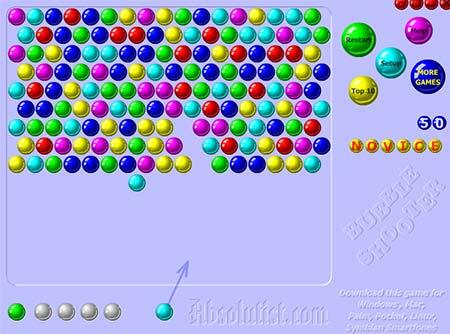 Welcome to bubble shooter, this website is fully dedicated to the populair game bubble shooter. You will find various online variants of the game and the possibility to play them all for free! Scroll down for our video instruction and hints for the game. We have updated our game to html5, play it below. Want to play the old version? 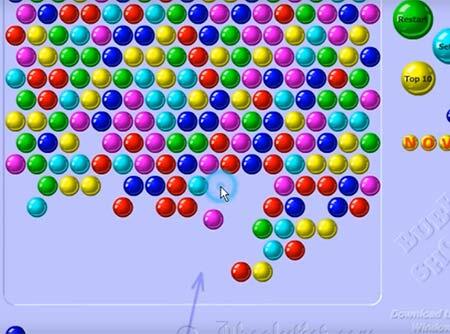 Click here for the original bubble shooter. We are working on our website to add more variety to our games. The games we are about to add are puzzle games like match 3 bejeweled, card games like Solitaire or Mahjong. This to give you more cool games to play. We are also updating our website. It already works for PC, mac, mobile and tablet. But the look and feel is a bit outdated. We are working on a more simple way of presenting the games to you. With less clutter and more focus on the games. Do you have tips for us on the website or do you know any games that you want to see? Sent your tips to us using our contact form. In bubble woods you must help the beaver to clear the playing field, this game is very colorful. The game mechanics are top notch and it features more then 100 levels. When you progress in the game you can buy power ups with the coins you have earned! A different type of game this time, help Fireboy and Watergirl to find the exit of the levels. You can move the 2 characters independent of each other. They each have their own strength and weakness. Use them wisely to finish each level. In total there a 7 worlds with 6 levels. This game will keep you busy for a while. We add new bubble shooter games on a regular base, when we find a new bubble game that fits are quality standard we will place it on our website. Our newest game is: bubble blobs, this colorful game has more then 50 levels which are playable on the map, the graphics are nice quite nice and are paint themed. Each level becomes more difficult. Another most played game is bubble spinner this bubbleshooter classic is a long time popular version. The bubble field rotates as you shoot the bubbles, this gives a whole new dimension. With our game bubble hit you can't go wrong, this game is popular in offices, it plays easy and relaxed. This video displays the gameplay of bubble shooter watch it to see how you will get far in the game. The trick is to make groups of bubbles, if you are shooting 3 bubbles at a time you won't make it till the end. Screenshot of the main gameplay area. You see the shooting arrow, the bubbles, score, how many bubbles untill next row and settings buttons. One more incoming row and this player is game over. 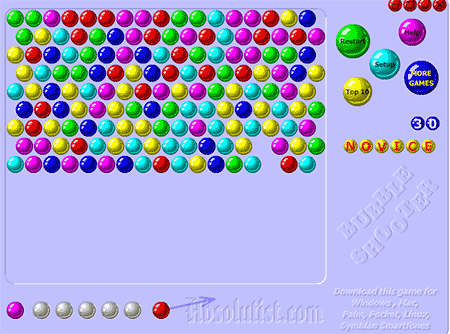 The player must pop the yellow and light blue bubble shooter on the right before the row drops. We have more bubble shooter games on our website, just browse to it using the top categories or the left sidebar. We are strolling the web for the best new games to present to you. 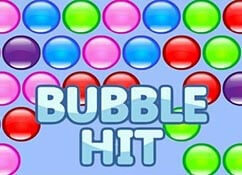 When we find new bubble shooter games we will add them to our website. Check out bubbles extreme or puzzle bobble, these 2 classics are great for everyone. Bubbles extreme is an extreme version of bubble shooter and puzzle bobble is the original version, it's a one on one copy of the original game. The best bubble shooter game! Bubble Shooter is rated 4.9 stars out of 5 with 1241 votes. Visit our bubbleshooter Youtube page. Here you will find gameplay video's, tips and tricks.